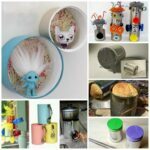 This week we have been looking at what you can make from a tin cans. 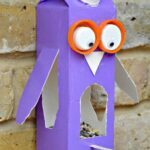 One of the classic tin can crafts for kids – are these fun Stilts. 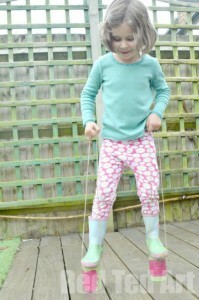 Pip Squeak (4) and I have had great fun making them and both the kids have loved using the stilts. It is really interesting watching them play with them and seeing how walking on stilts is great for their gross motorskills. Their whole body is involved in the act of walking and balancing. 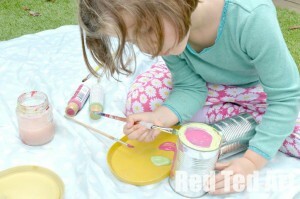 We painted our tin cans, for extra fun, but of course you can leave them plain too. 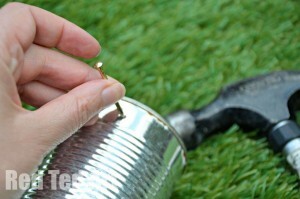 1) Carefully make holes into your tin cans, big enough to hold your string. You want two holes per can on opposite sides. We used a nail and a hammer, you may want to use a drill. A vice could come in handy, but we managed without. PLEASE TAKE CARE. 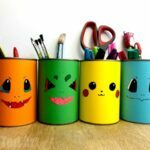 2) Paint your tin cans. 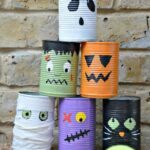 I loved that Pip Squeak first “just went for it” and by the second tin can had decided on a pattern… let your cans dry. 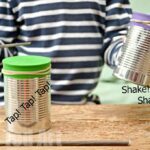 3) Then thread on the string to your tin can stilts and knot. Play! We found it was easier to walk on your stilts wearing shoes! Nothing quite like playing with homemade toys! The kids adore their homemade stilts. 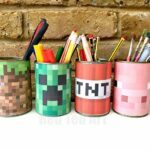 Hooray for Tin Can Crafts and upcycling! 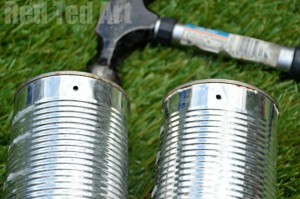 Hope you ave a go at our Tin Can Stilts! 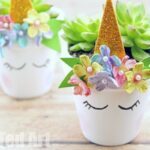 You may also enjoy making these Grass Heads this summer. 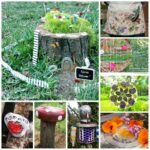 Quirky and fun and a great “learning” project!